The Hexa now gets a bigger touchscreen with Android Auto. Tata has also given its flagship vehicle new alloy wheels. A dual-tone roof option has been added to the top variants. Tata Motors has launched the 2019 Hexa in India with prices starting from Rs 12.99 lakh for the XM variant. The XT 4x4 variant tops off the range with a price tag of Rs 18.37 lakh (all prices, ex-showroom Delhi). While prices of the first four variants remain unchanged, the top three variants - the XT, XTA and XT 4x4 - are now dearer by Rs 20,000. The latest updated brings with it a bigger 7-inch touchscreen infotainment system with Android Auto connectivity. The 10-speaker JBL sound system has been retained. Meanwhile, the top-spec variants of the 2019 Hexa now get the option of dual-tone colours as well. The manual transmission variants of the Hexa will come with charcoal grey alloy wheels whle the automatic variants will get diamond cut alloy wheels. All prices are ex-showroom New Delhi. 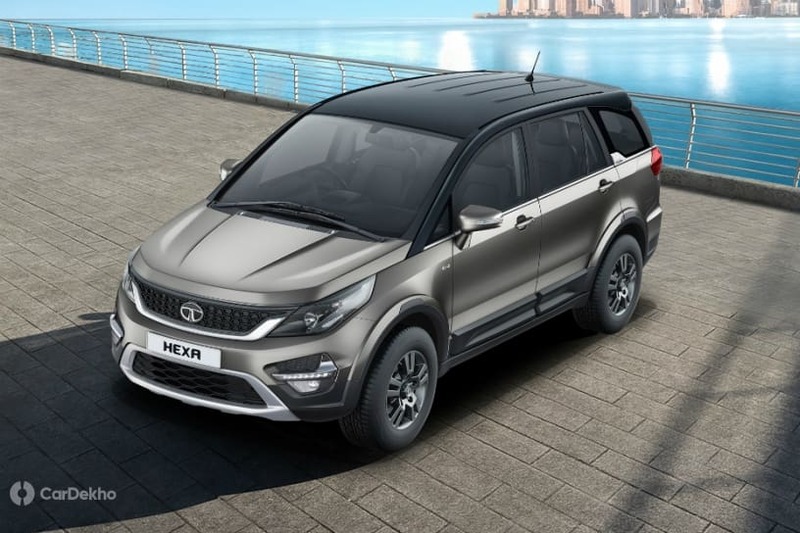 Mumbai, February 28, 2019: On the completion of its successful 2 years, Tata Motors enhanced its Hexa range of lifestyle SUVs with the launch of the Hexa 2019 edition. The Hexa 2019 edition sets itself apart with its style quotient and amps up the infotainment & connectivity offering, making it a perfect choice for the bold and successful. Based on the Impact Design philosophy, Hexa takes design to the next level with a host of dual tone roof options along with multiple options of alloys on the Automatic, 4*4 and other trims, to bring out the bold yet stylish character of the SUV. Equipped with new exciting features, the 2019 edition of the Hexa comes with Next-Gen technology of 7 inch touchscreen infotainment system with Android Auto connectivity across variants. The Hexa range starts at INR. 12.99 Lakhs (Ex. Showroom Delhi). The Hexa 2019 edition will come in 5 color options with 2 options of the Dual tone roof- Infinity Black and Titanium Grey, in the top end variants, reinstating the Impact design philosophy. This bold statement makes the Hexa stand apart from all the SUVs currently in the Indian market. Additionally, the 7 inch ergonomically placed touchscreen by Harman with Android Auto & 10 speaker JBL system, offers an extraordinary infotainment experience. Adding to this, the new Hexa 2019 edition will offer Diamond cut alloy wheels in the Automatic variants for the cool city sleeker while the manual transmission will be styled with Charcoal Grey Alloy Wheels, to complement the active and dynamic lifestyles of the customer. Launched in 2017, the Hexa has successfully established itself as a stylish, rugged and feature laden SUV with segment leading off-roading capabilities. True to its indomitable spirit, Hexa has established itself as a comfortable 6/7 seater SUV. On the occasion of the its 2 year completion, the Company also launched a ‘Hexa Exclusive collector’s Limited Edition Coffee Table book’ which chronicles the adventures of Hexa in different terrains and geographies.